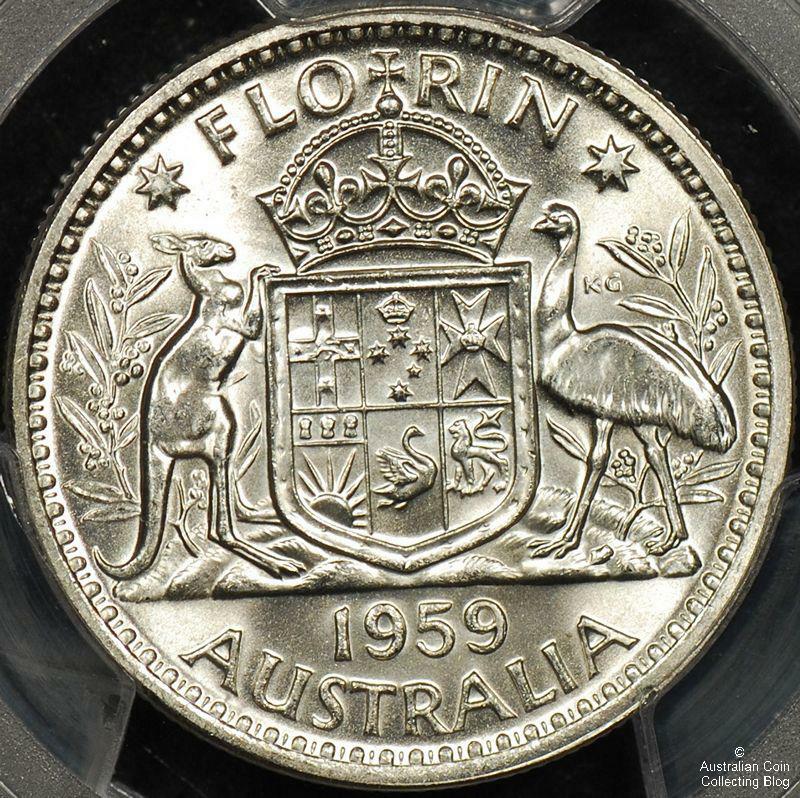 The Australian 1959 florin depicts a difference on the reverse die that doesn’t appear on coins of any other year. This difference is the appearance of an egg between the two emu’s legs. It’s called an egg but look closer and it really resembles a pointed arrow. The funny thing is that every 1959 business or circulation strike florin has this variety so it’s not scarce or rare. It doesn’t appear on the 1959 proof florins. Often listings of 1959 florins for sale state that their coin is the emu egg variety. You may be incorrectly alluded that you are purchasing a rare or scarce coin but do your homework. They all have eggs! 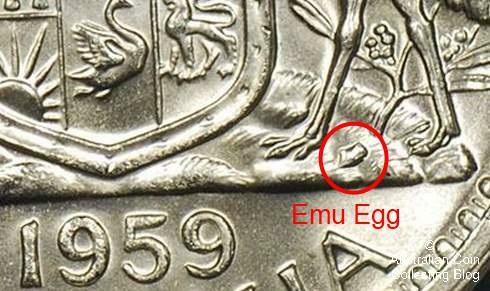 This problem is added to due to the fact that Renniks Australian Pre-Decimal Coin Varieties 1st ed (2005) lists the emu egg variety as scarce. I guess at a stretch it’s scarce if you’re looking at all florins with this reverse from 1938 to 1963, but for the 1959, I couldn’t even say common, it’s a given! Maybe that’s how the “rare egg” illusion started. Imagine a 2014 20 cent is released and collectors notice a substantial cud or slight die variation different to the 20c of every other year, after some time though it’s realised that ALL 2014 20c have the cud/variation. It wouldn’t be rare or scarce or even different to every other 2014 twenty cent coin. It is thought the egg appeared on the master die as a result of some sort of damage. It was then carried to all the working dies appearing on the resulting coin as a blob or cud.